Antrim put their relegation gloom behind them by pulling off a sensational 5-17 to 3-22 win over Laois in the Leinster Hurling Championship. Ciaran Clarke netted a stoppage-time penalty to give the Saffrons a one-point win at Ballycastle on Sunday. 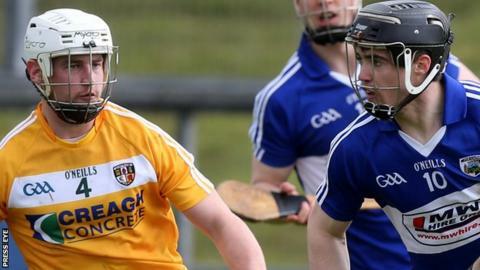 It was Antrim's opening match in the round robin series and followed their relegation to Division 2A of the National Hurling League. Antrim made a great start when Neil McManus got in a fourth-minute goal. Paul Shiels and Conor Johnson added points to give the Ulster county a 1-2 to 0-1 lead. But Laois began to play themselves into the game, and Zane Keenan steered a couple of frees between the uprights. Antrim struck a second goal in the 13th minute, McManus sending in a sideline cut from the left which Johnson finished to the net from close range. That was cancelled out almost immediately by a Laois goal from a Keenan penalty. Eoin Campbell nudged Antrim ahead by two at the end of the opening quarter, but Laois stepped up the tempo, reeling off 1-4 to take a five points lead. Their second goal was scrambled home by Tommy Fitzgerald, and they stretched further ahead with points from Keenan and Willie Hyland. Ciaran Clarke converted three Antrim frees, but it was the visitors who led by 2-13 to 2-8 at the break. The scores continued to come thick and fast in the early stages of the second half, with Antrim points from Clarke and Shiels cancelled out by Fitzgerald and Scully. Clarke's fifth free reduced the deficit to a single point, and Kevin Ryan's men were now performing with a confidence that had been sadly lacking during the ill-fated league campaign. It got even better for the Ulster side in the 50th minute when Clarke raced through to rifle home a fourth goal, putting them back in front at a crucial stage. The O'Moore men rallied again, Keenan and midfield partner Patrick Purcell hitting the target to put them back in front with 12 minutes to play. Antrim had just gone level through Deaghlan Murphy when Laois substitute Ben Conroy grabbed a goal, his dipping shot looping over the outstretched stick of Chris O'Connell with just four minutes to play. But there was more drama to come, and when referee Paud O'Dwyer awarded a penalty for a foul on McManus in the 73rd minute, Clarke stepped up to hit the net for a sensational win. Antrim: C O'Connell, R McCambridge, N McAuley (0-1), A Graffin, S McCrory, C McKinley, J Dillon, N McManus (1-2), M Bradley (0-1), M Dudley, P Shiels (0-3, 1f), E Campbell (0-1), C Clarke (2-7, 1-0 pen, 0-5f, 0-1 '65), D McClean, C Johnson (2-1). Laois: E Rowland, JA Delaney, C Healy, B Stapleton, J Fitzpatrick, M Whelan, C Dunne, Z Keenan (1-9, 1-0 pen, 0-7f), P Purcell (0-1), PJ Scully (0-3), J Campion (0-1), C Dwyer (0-1), R King (0-3), W Hyland (0-3), T Fitzgerald (1-1). Subs: B Conroy (1-0) for King, J Campion for Hyland, D Palmer for Scully.